It’s strawberry picking time! Sweet Berry Farm opened for the season yesterday and, according to their website, the berries are amazing! The farm in Marble Falls is free to visit, parking is free, you can pet the goats, horses and donkeys for free. But of course you will want to bring cash along to buy the berries that you pick. While there, you may also be tempted to purchase some homemade jam, homemade ice cream, homemade lemonade, and homemade popsicles. Do not trust your GPS to find the farm. Follow the directions found on the website. Only Cash and Checks are accepted. There is an ATM machine onsite. Bring a picnic! There are picnic tables onsite. The farm is closed ALL Wednesdays. After some berry picking (and eating), you may consider venturing over to the Blue Bonnet Cafe. Try one of the cafe’s 14 different kinds of pie! 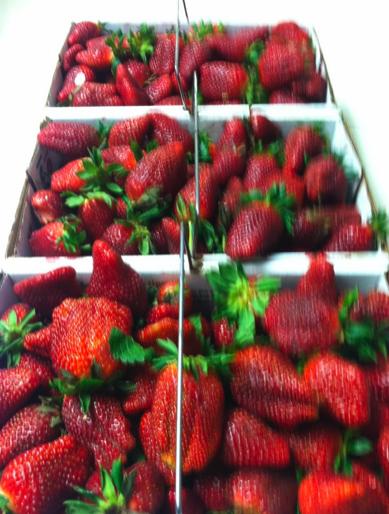 The Strawberries (March – April) are $2.75 per pound and Blackberries (May – June) are $3.25 per pound. The picking boxes cost 50¢ each and hold up to 8 pounds of berries. There is no minimum or maximum amount of fruit you have to pick but you will be responsible for what you do pick. Open Monday – Saturday (excluding Wednesday): 8:30 a.m. – 5:30 p.m.
Open Sunday: 1 – 5 p.m.
For more information, visit the Sweet Berry Farm website.